By some amazing gift of foresight, our plans for Thursday involved less amounts of strenuous walking. We left the hotel between 10 and 11, heading towards the East end of Paris where Père Lachaise is situated. It's the largest cemetery in Paris and is the resting place of many well known figures. We bought a map for a couple of Euros at the entrance which laid out the grounds and marked where people of interest are buried. It was a relaxing walk in the sunshine and interesting to see all the different types of headstones and family crypts ranging from huge monuments with sculptures to small more modest headstones. The first well-known crypt belonged to the composer Rossini. It was later I found out that he is no longer resting there as he was moved back to Italy in 1887 at the Italian government's request. Next we went on to find other well-known musical figures like Chopin, Jim Morrison and Edith Piaf. Our next visit was to Oscar Wilde's resting place as Lu is a big fan. Along the way we managed to find the resting place of Parisian photographer Nadar. We found Oscar Wilde's tomb surrounded by glass because it has been subject to vandalism over the years. This appears to have deterred vandals and also has allowed visitors to write messages without damaging the stonework. After Père Lachaise, we headed over to Montmatre for a wander around. We stopped for lunch then made our way to the Sacré-Coeur. If you've never been to Paris, this is a prime spot to see what street scammers get up to. On the stairs to the Sacré-Coeur, there are big groups all trying to reel people in. What they do, if you let them, is start tying bits of string around your finger. The make a plait for your wrist and then charge you lots of money. This is probably a prime spot for pick pocketers too as your attention is focused on what's going on in front of you. The best way to avoid them is to keep your hands in your pocket as you walk by and if they try to approach you, just ignore them or tell the "non!". Like bloody vultures they are. The Sacré-Coeur itself is a beautiful building. Sitting right on top of Montmatre, you get a great view of Paris from the steps. Photography isn't allowed inside the building which was disappointing because there were so many things to take photos of. Rules are rules. On or way around we picked up a big candle for 10€. I'm not sure if you're supposed to take them home but we have done anyway because we're going to place it on Lu's Dad's headstone back home. After Sacré-Coeur, we moved on into the streets of Montmatre. Architecturally speaking, this place is what I'd describe as typically Parisian meaning there are lots of cobbled streets with cafés lining them, lots of people sat around on tables outside drinking coffee, beer and wine in the sunshine. That sort of thing. A really nice place to walk around. We stopped for a breather outside the Moulin Rouge then headed back up the hill with a crépe. We found our way to a square where loads of street artists were selling paintings. Lu was saying last time she was there, some start drawing you if you stop then demand money so be wary of that if you go. Some artists were producing amazing work but there were some whom I thought weren't quite as good. One guy had a series of ink sketches of different landmarks around Paris. We ended up buying one of his sketches which was created in the same square looking towards the Sacré-Coeur. Aside from us thinking he cheekily upped his price when he knew he had a sale, we were really happy with it. After the artists market, we called it a day and headed back to the hotel to rest. As we waited for nightfall we went back to Mise au Varre for dinner as it was so nice a few days before. I can confirm the quality of their food is consistent! After dinner we went out to see the Eiffel Tower lit up at night. 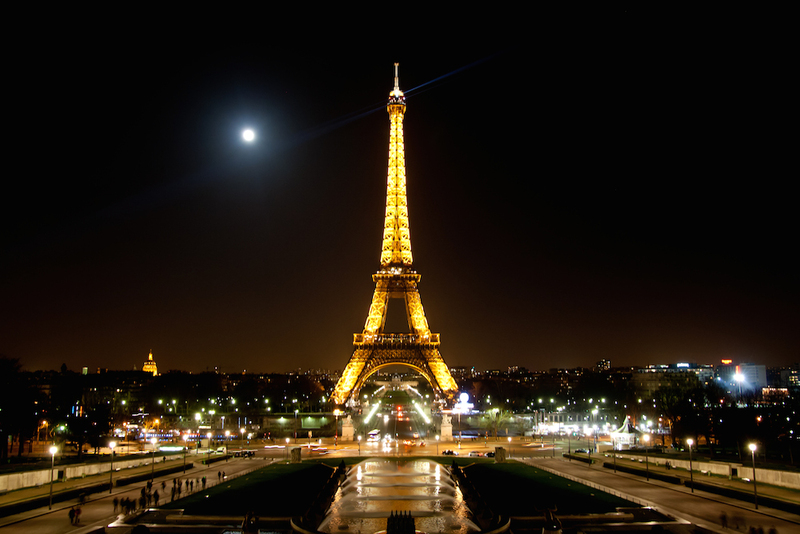 If you come to Paris, you must see it at night, it's a wonderful sight.